JBS United is a 2017 Targeting Excellence Platinum Sponsor and has been a partner since the inception of Targeting Excellence in 2014. Founded in 1956 in a small one-room office, John B. Swisher has grown his vision into the American dream. The vision is simple, provide value to the producer and both companies will be successful. JBS United remains more committed than ever to providing proven, research-based nutrition and health solutions that create value for livestock producers. Originally known as United Feeds, JBS United sets itself apart by intimately knowing your business and understanding what you need to be more successful. That guiding principle is still the foundation of JBS United – focus on the customer and their success. Today, JBS United offers diverse livestock nutrition and innovative health products globally through the JBS United or affiliate brands. Headquartered in Sheridan, Indiana, our team members are positioned around the nation to assist customers with their business needs. JBS United has the capabilities of a massive organization while maintaining the agility of a small company. The JBS United organization now extends to 23 countries, including South Korea, the Philippines, and locations in South America and Europe. David Cain took a few minutes to discuss why JBS United is committed to supporting Targeting Excellence. Why do you feel it is important to support an organization like Targeting Excellence? Cain: We believe in the future of animal agriculture and are pleased to be a part of organizations that contribute positively to the industry’s greater good. What do you feel is the biggest impact Targeting Excellence is having on the animal ag industry? Cain: Creating ways for people to interact, showing the way for students pursuing an animal ag career helps to shape the lives of students as well as the industry. What has pleased you most about working with Targeting Excellence? Cain: Being an active part of Indiana’s committee. 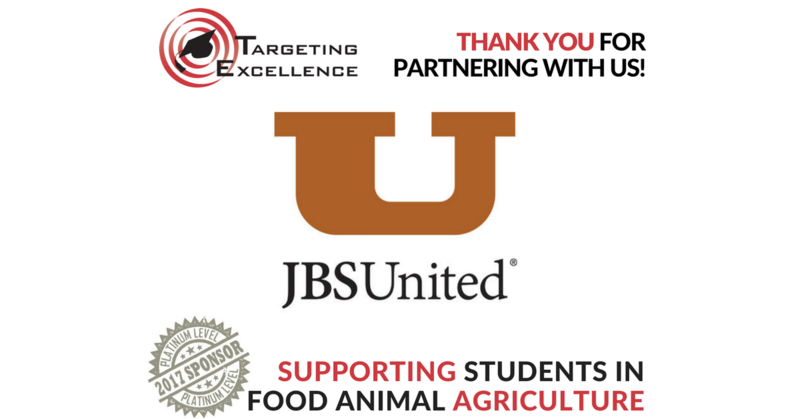 Thank you JBS United for helping SUPPORT Students in Food Animal AGRICULTURE! Targeting Excellence has set a goal in 2017 to raise $225,000 in scholarship funds that will be awarded to students in 2018. Committees comprised of individuals from food production systems, allied industries and university professors are volunteering their time and resources to raise these funds from national and regional sponsors. In keeping with our mission these committees are also actively planning events in 2017 for Indiana, Iowa, Minnesota, North Carolina, Ohio, Pennsylvania, and Wisconsin that will allow students and industry leaders the opportunity to meet and network. Targeting Excellence hopes to see you at one or more of these events this year. Learn more about sponsor opportunities available through Targeting Excellence and either register as a sponsor or give a personal donation today.